I know I’m opening the floodgates when I mention the “D word,” but I’ve been dying to start covering Disney movies. Naturally, I was raised on them and this lucky little person got to experience the Disney Renaissance first hand. The movie previews alone were enough to completely blow me away and then came the toy and food promotions. By the time opening night rolled around, I was a big bundle of nerves and excitement. One of these beautiful films carved into my memory is Mulan. It’s one of my go-to movies and has traveled by my side on just about every family vacation since its home video release. Hardly a day goes by where I don’t bust out a quote or a bit of song from this movie. It’s been like that since the days when my cousin and I would lock ourselves in her room and sing and dance to the soundtrack in our Mulan garb. (She had one wrap-around costume that we’d take turns wearing.) When that was no longer enough, my grandma whipped up the perfect Halloween costume for me that I’d still wear today if I could fit in it. You don’t meet a movie like that every dynasty, so it’s only natural that it would become a part of my life. No, I don’t see myself defeating Shan Yu and saving China, but that doesn’t mean I can’t be Mulan in my own right. Whether I’m off to destroy people or just heading into work, the best way to start my morning is with a nice breakfast. And one that’s happy to see me to boot. Okay, so rice porridge can be pretty simple, but it’s delicious and comforting and I’d smile right back at it if I ate a big bowl of it every day. Recipe makes 6 one-cup servings. In a large pot, combine water, chicken broth, rice, garlic, onion, and ginger. Bring to a boil over high heat. Reduce heat to low, cover, and simmer for 1-1 ½ hours, stirring occasionally. You want a creamy, oatmeal-like consistency. If it gets too thick, you can add more water or broth. If it’s too thin, allow it to cook longer. Remove ginger piece. Season with salt, white pepper, and soy sauce. Place a frying pan on medium to low heat. Coat the pan with olive oil. Crack eggs directly into pan and cook until the tops of the whites are set and the yolk is still runny. If the eggs start changing color, turn down the heat. Remove from pan with a spatula and season with salt and white pepper. Place bacon in a cold pan and set heat to low. When bacon begins to curl, flip it to the other side. This can take about 7 minutes. Continue to cook, flipping it over every few minutes, until it’s browned and almost at your desired crispiness. The bacon will continue to cook after it’s removed from the pan. Drain excess grease by setting the bacon on a plate covered with paper towels. Scoop out a cup of porridge into a bowl. 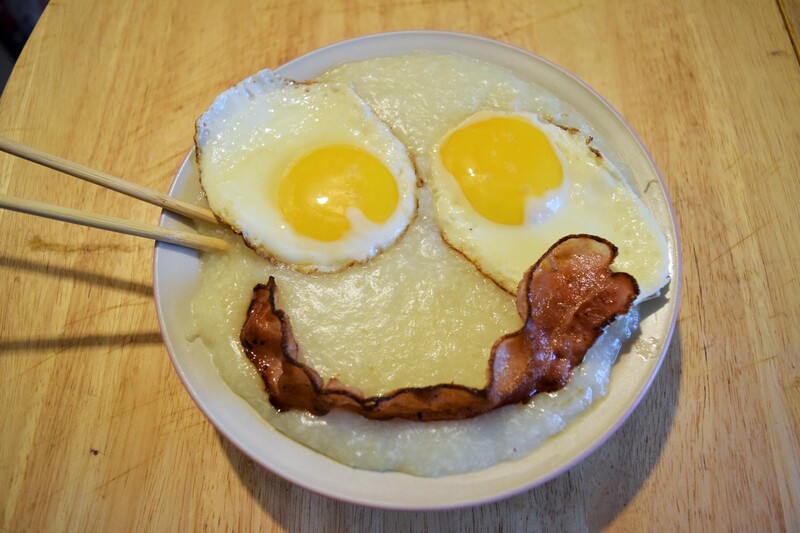 Place two eggs on top for eyes and add a bacon smile. Grab yourself a pair of chopsticks or a spoon and dig in! My family is the most important thing to me and I’d do anything for them. That’s why I made enough rice porridge to serve my entire household. I find it a little safer than stealing my father’s armor, running away from home, and impersonating a soldier. 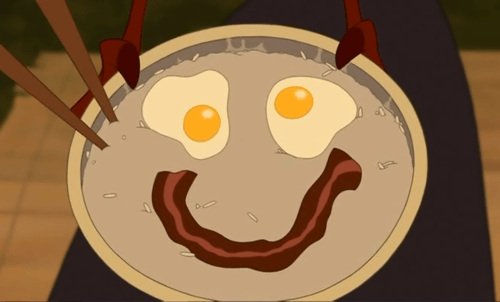 Mulan already has that covered, so I’ll just let my heart show me the way to my own greatness, or maybe just a second helping of porridge.